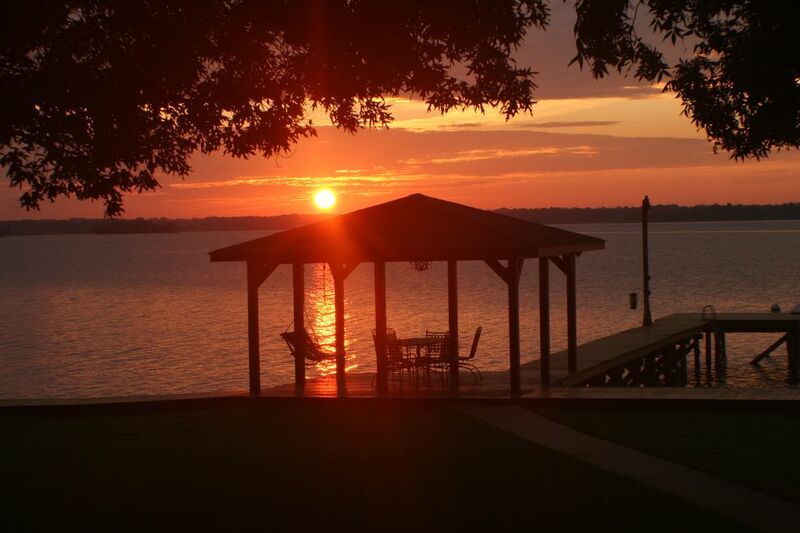 3 bedroom, 4 bathroom with wide open waterfront views of Lake Norman. Come and "Take it Easy" at this waterfront home and enjoy the breath taking panoramic views of Lake Norman. Located in the middle of an 8 mile stretch of open water at Marker D7, you will be in the perfect position to view and enjoy it all! Rock your troubles away on the front porch or relax under the gazebo on the private pier...while enjoying the sail boat races hosted by the Lake Norman Yacht Club (located just down the road), or find yourself amazed by the antics of those playing on the lake. With plenty of space to sun bathe, play in the water, or relax under the shade of the mature trees...you will never want to leave. If boating is a favorite past time...bring your boat and put in at the private boat slip located in the yard. If you do not have a boat, there are several marinas in the area that rent them by the day. Golfers can enjoy the shores of Lake Norman while playing the courses at Trump National Golf Club, Mallard Head Country Club, or many other courses located in the area. There are many fun attractions and activities to keep your family entertained while visiting! When you find that you must go inside you will appreciate that the main floor has been updated with an open floor plan to bring your family together. The large living room has two tv's for optimal movie watching, comfy sitting areas and lots of games to enjoy with the family. Do not worry about missing your shows while getting a snack or a meal from the kitchen...go sit around the built in island and and watch the 20" under cabinet mounted tv. The island is a great gathering place for family meals or you may prefer a more formal meal in the dining room. When your family is ready to settle in for the night you will find the upstairs calling your names. The master bedroom has full lake views and a great large balcony. The indoor sitting area beside the gas log fire place is a nice place to unwind before crawling into the king size bed. The master bedroom has two bathrooms...a his and hers for those that like to get ready in their own space (a shower in each). The other two bedrooms upstairs share a bathroom between them. This bathroom has plenty of vanity space for getting ready and a regular size bathtub/shower. Bedroom #2 also allows wake up views of the lake from the comfort of the queen size bed. While bedroom #3 doesn't look directly at the water, it is a great room for those that like to sleep a little later...affording a little more privacy and less distraction from the views. Queen size comfort also awaits its weary guests. Ceiling fans, tv's, and cozy bedding are located in all three of the bedrooms. Want to bring your family dog? No problem! This home is dog friendly and there is even a fenced in area of yard for outdoor play. If Rover or the kids need to be hosed down before coming into the house...no worries! The outdoor enclosed shower is a great place to clean them off - or for you to sneak in a relaxing shower in the outdoors! There is also a bathroom/shower on the main level of the home. "Taking it Easy" offers everything you are looking for in your next family vacation...lovely property, comfortable home, and a quite neighborhood that is close to shopping, activities, and fun attractions. The location and amenities also make this a great location for family reunions, weddings, celebrations or corporate events. Please contact us for pricing and availability for events other than family vacations. Well stocked - Should find everything you need! Full kitchen - refrigerator, stove top, convection oven, microwave convection oven, 2 dishwashers, dishes, pots/pans, utensils, etc. Great flat yard for entertaining! No Smoking allowed inside of the house! Smoking outdoors only with disposal of butts. The pictures for this amazing lakefront home do not do it justice! We had three couples on a weekend getaway and even with the rainy weather had an amazing time because of the setting! The master bedroom is insane and the other two are big and comfortable. The kitchen is so big we all helped make dinner and ate at the island. Sitting by the fire pit at night and waking to the quiet of the lake was heaven!! Crissy was great and answered all my texts when I had a question. We will be back! Everything you need to "Take It Easy"
We just returned from a wonderful week at this property. We celebrated Thanksgiving with our son and his girlfriend (now fiancé) and her parents, oh and the fur babies. Crissy was so great to communicate with and made sure the home was stocked and then some! If you are vacationing with your pups this is the best place on earth to do it! There was plenty of room for them to run in the fenced side yard and they had easy access to the water on the boat ramp. They LOVED it! We also took them to the Lucky Dog Bark and Brew which was a bit overwhelming but enjoyable. There is so much to do in this area even in the off season. We found consignment shops and craft breweries in short driving distance. This property made the perfect setting for our son to propose to his girl at sunset on the dock. The view of the lake is phenomenal! Thank you Crissy for opening your beautiful property so people like us can make memories there. I am so glad that you enjoyed your stay and that our home will now be a part of a special family memory! Great house in a beautiful location! A very nice, well maintained house in a beautiful location. It was a little too cool during our visit to enjoy everything the property has to offer but nevertheless, we had a wonderful time. Scott and Crissy could not be more gracious and accommodating hosts. Beautiful location and home! Too short a visit! Great house with amazing lake views. Plenty of space and clean. We went over the winter and had a great time. Any Holiday Weeks or weekends are an additional $250.00. Please contact the owner for Event pricing.